The Thrifty Mommy: Need Some Perennials for Your Garden?? Tis the season for planting new perennials in your garden. 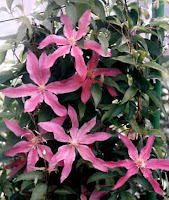 I was in The Christmas Tree Shops and they had lots different of different ones....... Day Lillies, Astilbe, Gladiolas, Peonies, Clematis, and many, many more. They were all very reasonably priced between $2.-$5 each. Perennials are great for the garden, as they come back year after year unlike annuals. Perennials do not bloom all spring and summer as annuals do, but the do usually bloom for a few weeks, some a bit longer. Perennials are season bloomers...some bloom in summer, some in spring, etc. Adding many different perennials is a great way to add different colors to your garden throughout a few seasons!! Another reason why perennials are so great are that after a few years they can be split. This is great if you have someone to trade perennials with....then you can trade plants for free!! My mom and I do this all the time...or you can split your own perennials and plant them elsewhere in your garden. Splitting also helps the perennial to stay healthy over the years. Perennials require very little to maintain. They do however, require good soil, a bit of watering, and fertilizing. Oh yes and a little bit of weeding too!! Yes, I know it stinks, but the weeds if let go will steal the water and nutrients from your pretty perennial, so it is necessary to get the weeds out ASAP. With a few easy steps you too can have a very pretty perennial garden to enjoy real soon. Happy perennial planting! !